the server, is stopped or restarted. Use the 'Save settings' link to make the changes permanent. It copies / saves the configuration files in the memory, to the location specified in the 'Filename' field. 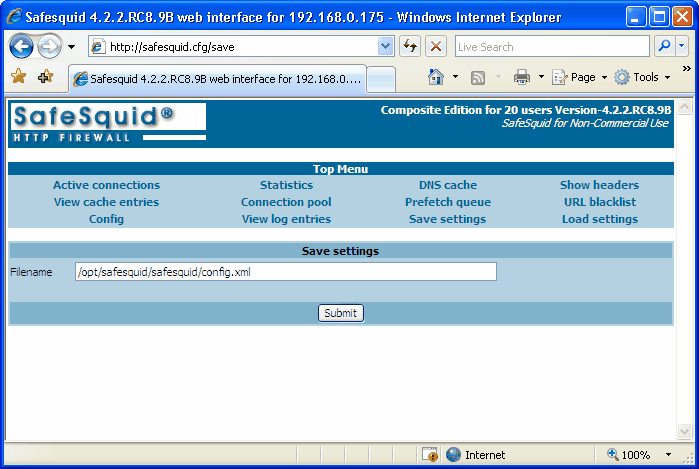 The default path to the configuration file is /opt/safesquid/safesquid/config.xml for Linux, and C:\Program Files\SafeSquid\xml\config.xml for Windows. On successfully coping the file to the specified location, you should get a “File saved “ message. /opt/safesquid/safesquid/config_org.xml. This would create a backup file 'config_org.xml' in the same location. Now if anything goes wrong while making changes, you can also load config_org.xml with Load Settings option, to roll-back to the original configuration.